Sam approached us a few months ago to ask about his options after completing his MBA at Penn State’s Smeal College of Business, which has a strong reputation for supply chain management. He, however, wanted to do something outside supply chain. He had a few opportunities on the table. Among them was an offer for Deloitte’s Federal Consulting practice. People from Penn State had been hired in the past at 2 levels and Sam – with solid extracurriculars and work experience at Nike – should have been a strong candidate for the higher position. Sam also wanted some clarity on what was next for his career, so that if he did decide to take the job with lower pay, it would at least be with a long-term strategy in mind. Jenny Rae jumped in on a call with him to help hash out what he wanted and where it would put him 5 years down the road. I’m sure you all want to know how it played out – what did Sam decide? Don’t be lazy – read to the end to find out! I’m doing pretty well, thanks. How is everything going on the recruiting front? It’s going pretty well. I’m working with a couple of my connections here in the MBA program to see what other options or opportunities might be available, and I also have a couple of calls scheduled with some folks at Deloitte to walk through the offer and where people see business opportunities within the company. I am looking to see where I might fit into that and just kind of get a better sense of how should I go there, and how that might look over the next couple of years. So kind of busy. Well, awesome. No big deal, just planning the rest of your life. Not a big issue, right? Well, did you have some specific questions that you wanted to run by me related to the offer and your discussion around it? Yeah, I have two areas I’m focusing on. One would be how to approach networking type discussions with different people from the firm. I have calls scheduled with pretty friendly alumni that I know already, just to get a better sense of their specific work experience. But I also have a call scheduled with a director there later this week, and my goal is just to really get a sense from him on how he sees the business going over the next couple of years, including any strengths and opportunities that Deloitte’s federal practice and operations practice has, just so I can get a better understanding of all the opportunities. For example, if I’m only going to be working in the defense industry, and there’s not going to be any opportunities outside of that, then that’s maybe less interesting to me. Or maybe they will cover USAID, or the State Department, or HHS, and stuff like that – then I would be a little more interested. Is that the right type of question to be asking a director level person about his view across the business, versus a general practitioner who has been there for a year? The second issue is that I’m trying to figure out what my other options are that I should be pursuing. Absolutely. Let’s talk about issue #1 first, and let’s talk about the senior conversation. Now, do you have any kind of leading ideas about what you think the senior partner might say? I don’t, which is kind of tough. I’m going to try and gather that from these other conversations that I’m having with these friends of mine, the alumni that I have there, so that I can get a good sense of what his thoughts might be. Here’s my question. What is your main objective with him, Sam? To try to help you decide whether you want the opportunity, or to convince him that he needs to hire you at a higher level? Because I think the questions you are going to ask are going to be different based on your priorities from a negotiating standpoint, right? Right. So my goal with him is to really feel out the business and the opportunities there for me, to see how much I really want to push on that kind of negotiation process. So I think that – should the job seem more appealing, for example, based on his perspective of the business, then I would actually go to someone else to negotiate, not him. So I haven’t had any conversations with him directly about my position or placement. I had an initial conversation with a partner, then just briefly followed up with HR. So I don’t know if it would be appropriate for me to push to hire me at a senior level instead of like a consultant level with him right now. I think I would prefer to do that either with the partner I initially talked to, or an HR person. That’s just kind of my sense. Does that seem right? So, I think that if you are going to get escalated, he’s going to have to sign off on it, or somebody at his level. HR won’t be able to do that for you. So I think that if a negotiation is still on the table, I think that your approach needs to be more direct – you can ask these kinds of questions, but you don’t want to push too hard on anything that might be connoted as negative, right? Here are a few sample questions that might fit your situation better: Tell me about what you see is the future of the business, what you expect, not in terms of numbers, but what might growth look like in percentage terms? How is your team structured in terms of bringing business in, and where do you think that’s going to change in the future? Talk about those kinds of questions that will be on his radar, but don’t imply something that says – Is your business going away? – which is some of what I got from the other kinds of questions you were getting at. Does that make sense? Yeah, definitely. I was thinking about questioning more along the lines you described – you said it very clearly. It is an issue, to be honest – with the federal government cutting back spending on defense, Deloitte’s defense business might go away. So it is an issue that you need to think about in terms of your career, right? As I am thinking about how their business is structured across the different sectors that they operate, some agencies are more appealing to me than others, and so if all of the ones that I’m interested in are disappearing, then that makes the job a little bit less appealing. Yeah. So maybe a good question around that would be: Tell me today, not just the organizations that you work for, but the percentage of revenues that come from each one of them. At least generally, right? Because having a list may mean that I would have a 0.1% chance of working for that organization that’s particularly interesting to me, whereas knowing the kind of mix of the organizations would really help. And also, where do you see that going in the future? He may not be able to give you exact numbers, because you’re not really under an NDA at this point, right? But he could give you representative information that might be really helpful for you. So those questions will be helpful, they will help you decide, and also help communicate alignment with what they’re focusing on, right? Yeah, totally. In terms of talking about career path and placement at the consultant level, is that an appropriate conversation to have with a different person also? I met this partner at an information session and we hit it off and all that, and he reached out to me afterward, so he knows probably what my offer is, but wasn’t involved in the decision-making process. I think it would be appropriate though for you, Sam, to say “Look, to be honest, Deloitte is really one of my favorite options that’s on the table right now.” If you can tell him that truthfully, I think you should say that. Ask him a question that’s leading. If he jumps in and says – “We can make that happen, that’s not a big deal” or “Tell me why you think that?” or “Let me explain why we put you at that level,” those all tell you something. If he says, “Let me explain why we put you at that level” – then you know he was in on the decision, and it’s going to be tough to change. But just asking that kind of question is going to lead into a really robust discussion. You know that the outcome may be that they still don’t want you to come in at that level, and then you still have to make the decision. But the outcome could be that at least you were communicating that you bring enough value to the table and you’re setting yourself up for success regardless of whether you accept or don’t accept the offer later. Yes. That makes a lot of sense. I’m a pretty straight shooter too, and I think it could be good. Yeah, definitely. So I think my key objective within Deloitte right now is building perspective. I’ll talk to a couple of people that came into the firm at the consultant level from Penn State last year and get a sense of the type of work that they are working on and doing what they’re doing after working for several months, as well as some who have been there a little bit longer. And I’ll also talk to Scott, the Director, and the HR person. What other approach could I attempt or should I stick with the HR person? My question would be, if I try to start the negotiation process – who would be best to initiate that with? HR? Who would direct me to a partner who makes the decision, or what? Let me ask you a question. Was it ever discussed earlier that you could potentially come in at another level? Or anywhere in the process was the position – the level that you were actually interviewing for – discussed? Not explicitly. When they posted for the position and I applied for the position, it was listed as hiring for consultant/senior consultant. It was pitched that way, and then I learned that I was being hired at the consultant level when I got the phone call to give me the offer. So that’s kind of the extent of the discussion. In the moment of receiving the offer and talking about it with the partner, I didn’t feel like it was right to kind of push back on the position that they were giving me at that time. It was more just trying to be thankful for the offer and willing to talk about it over time. I think that’s a good call. Where you are, at this point, how long would your promotion process be? Do they also lay that out for you? That’s something I need to clarify too, and I guess the best person to talk with would be the HR person, or someone else? Yeah, HR makes the most sense for that question. I guess I’m having a hard time trying to figure out who the best person to approach is. So I think you can address almost all of this to the Director, to be honest. Ultimately, the HR person is going to administrate that discussion, but they are not going to be able to sign off on major changes. So I think – there are two issues. One is that you don’t have a clear sense of the promotion pathway because if you go to Deloitte, you want to stay for a long time. So have them tell you a little bit about what you could expect, and what some of the key parameters of success are. And then second, you would like to come in one level higher than what you was offered, and you think you’re qualified for it, and you’ve seen a precedent of that happening in the past. I think those are the questions that you’re asking at the Director level. At least he’s in the loop, and he can just level with you and say that he has no idea, which is fine, or maybe he can point you to the somebody you really need to talk to about this. Does that make sense? Yeah, that definitely makes sense. Okay, cool. Good. So that’s kind of where this Deloitte thing stands. I guess the only other thing added is there is a weekend event in a couple of weeks, so that’s just kind of another opportunity to get involved with some people. That will be on the 20th and 21st. I’m definitely trying to build up a network of people that I’ve been able to communicate with between now and then so that I can continue to make positive impressions between now and then, and after that I’ll still have almost two weeks to make my decision. Still, I don’t know what to expect during that Sell Weekend. Where are you leaning right now? If tomorrow you had to make the decision, what percentage chance is there that you would accept this offer? I would say 65-ish, 70 percent. I think a lot of it is driven by not having many other offers – well, that’s not true. I would say this is the job that I have been targeting for a long time, so it’s an opportunity that I wanted, and that the work is something that’s really interesting to me, and I’m really excited about. The money and the mission part, I guess it leaves a lot on the table in some ways. Just given what I think I could provide to the company, and what they could provide to me – I think that’s one of the big, big drawbacks. I think the other one is that I don’t feel like I’ve had the opportunity to fully explore the range of options that are open through our program, and working to really find out what other opportunities might exist, I guess I feel like I wouldn’t be 100% ready to accept tomorrow. So it sounds like you’re in a good position. Let me ask you another question. What else are you thinking about? How are you spending your time focused on other opportunities? Because if this is the top one right now, I would even say the chances are probably higher, but the issue then comes down to what are the other opportunities that are on the table? So what else are you actually working on? I’m working on a couple of Apple positions that were posted, in operations – those were posted on our website and they traditionally hire a couple of people. It’s a place where I have a couple of relationships with folks there, so I’m trying to talk to them about what their timelines look like to see if there is an opportunity there. I’ve also talked with a couple folks in Charlotte, someone in private equity in Charlotte. It’s not necessarily what I was looking to be in, but he has a lot of good finance connections in that area and is helping me get connected with a couple of different types of opportunities and connections in that area. So I’m looking at some more corporate finance roles, as well as some financial services roles in wealth management and their structure and work-life balance. And so I’m waiting right now to hear back from him on what opportunities there are. Outside of consulting, I’m leaning towards going back either into corporate finance or financial services. Financial services not like private equity or anything where I would be insane. So, I think that’s kind of the track I’m taking – I’m really trying to hit the network on a couple of these other opportunities. Not necessarily definitive opportunities, but understanding what other options might be at play. I’m in such a tight time frame right now to make a decision. So, I think basically you have a dual track. One is to pursue this opportunity with Deloitte pretty hard-core and make it what you want to. It sounds like that’s your best option on the table right now, and definitely I would think it’s possible. You won’t know until you have the right conversations inside the firm, build the right allies, ask the right questions, but it sounds like you’re on a pathway to do that – just be really strategic about it. Then, I think if you can land one other offer, you’re going to find that the pressure is on a little bit more at Deloitte and you’re going to feel a little bit less like you just have to take what they give you, as well. Therefore, I think those are your dual objectives. Yeah, that’s pretty much where I have to do my work. And I guess the timing of it makes it pretty tight. But you know what? You’re highly qualified, you have a great internship on your resume, you’re at the top of your class, both in terms of leadership and actual experience. You’re in a program with strong capabilities and focus that is desirable out there in the world – so you’re going to be fine. I don’t want to talk you into taking the job at Deloitte if you feel like there’s something else you want to do because you’re going to be able to hit the numbers and have a great career if you go somewhere else, and I really want to encourage you toward that. But I think if it is something that you want to do and you can make it wonderful, then I think it’s a pretty neat option on the table. Just think longer term. You’re going to be able to move from the federal practice into private sector, but it is going to be harder. If you want to start in private sector, you’re going to have an easier time going anywhere. Yeah, I think that’s kind of a long-term challenge, I guess. Yes, exactly. What are you thinking on that? I like the exit opportunities outside of Deloitte into federal. It could be like a two-step process. Well, anything else I can help you with? No, I think it was really good just to kind of have confirmation on the strategic conversation topics that I’ve been thinking about, and getting a good sense, based on your experience, what I should be and shouldn’t be asking. I really appreciate that you could walk through all of that. Awesome. Well, let me know how Sell Weekend progresses, and if there’s anything else I can do, you know where to find me. You’re so welcome, Sam. Have a great day. You too. Talk to you later! What happened? Well, after sell weekend Sam accepted an offer from Deloitte’s Federal Consulting practice in the Washington, D.C. office for the original offered position – he decided to take the long-term view. Want to work with us to figure out what to do next? 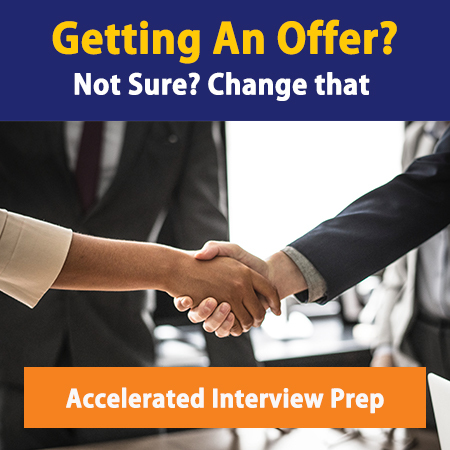 We offer a Power Half Hour – 30 minutes of power-packed advice to help clarify your choices and make sense of the complicated job landscape for the benefit of your long-term business career. Learn more about doing a Deloitte case interview, tips and its history.